Three members of a family died in a landslide while more than 3,000 people were displaced temporarily due to floods on the Hanumante river following torrential rains in Bhaktapur on Wednesday night. According to police, Hira Bahadur Lama, 70, his wife Pan Maya, 62, and their granddaughter Sampada were found dead after their hut was swept away by landslide in Changunarayan Municipality-7. 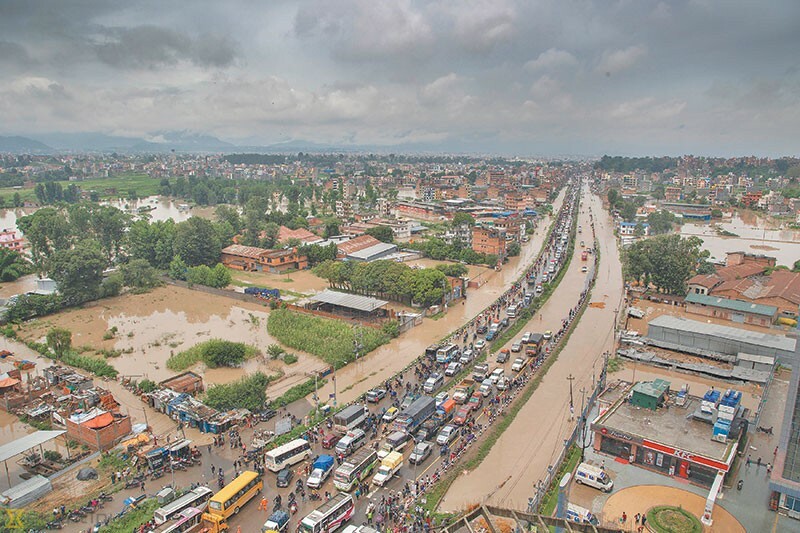 Inspector Himal Shrestha, spokesperson for the Bhaktapur Police, said 111 people were rescued from floods in the Radhe Radhe area and the nearby Khasangkhusung river. Three of the injured returned home after treatment at Bhaktapur Hospital. Shrestha said 500 families in the area were still unable to return since the water level had not gone down. “Most of the people we rescued are earthquake victims staying in temporary shelters and vegetable farmers. Their place is unlivable,” said Shrestha, adding that they may be displaced for two more days. A large number of security personnel--788 Nepal Police persons, more than five dozen Armed Police personnel and Nepal Army soldiers--and Red Cross members were deployed for the rescue operation. They used rafts and cranes to rescue people. Throughout Thursday, areas in Bhaktapur including Madhyapur Thimi, Sallaghari, Jagati and Kamalbinayak remained inundated, hindering public mobility. Traffic police said vehicular movement on the Araniko Highway was disrupted for two hours with parked vehicles still submerged. The road from Kamalbinayak to Jagati was obstructed due to waterlogging throughout the day. Schools, hospitals, shops, and industries in the Radhe Radhe and Madhyapur Thimi areas remained closed throughout the day as water level rose up to four feet above ground. Iwamura Memorial Hospital and Siddhi Smirit Hospital were flooded. “The first floor of the hospital has come under water. Equipment such as X-ray and ultrasound machines have become defunct. We have shifted patients to an upper floor,” said Uttam Dhaubanjar, cashier at Iwamura Hospital. Actual losses caused by the disaster have yet to be assessed but police suspect property worth billions of rupees to have been destroyed. From early Thursday, people started coming out of their homes, carrying their belongings to safe spots. People were seen on rooftops, waiting for floodwaters to recede. “I was in a deep sleep in the morning. Suddenly water gushed into my room and filled it up to three feet. It was scary. I was more concerned about my one-year-old baby and rushed to the upper storey,” said Santosh Prasain of Sallaghari. This is not the first time that the area has been inundated. In 2015, Hanumante River displaced 850 people from their temporary shelters at the Maheshwori playground. These victims had become homeless in the earthquake earlier that year. Chief District Officer Narayan Prasad Bhatta said the inundation was caused by the swollen river. Geologists blamed encroachment of riverbanks and haphazard sand mining for the mayhem. In Kavre, an elderly man was swept by the flooded Jhiku stream in Panchakhal Municipality-12 on Thursday. According to the district police office, Dornath Kunwar, 75, had drowned. The Army rescued two workers caught in a flood of a local stream in Namobuddha Municipality-7. Soldiers airlifted them using a helicopter. In Banepa, the Punyamata and Chandeshwori streams flooded settlements. UML lawmaker Mahesh Basnet on Thursday urged the government and police to take action against people who made memes of Bhaktapur floods with pictures of boats and circulated them on social media.Speaking to the Lower House on Thursday, the UML lawmaker from Bhaktapur-2, said posting flood-related pictures on social media was an insult to the people of Bhaktapur. He pressed for booking such people under cybercrime. The lawmaker urged social media users to respect the feelings of those affected by floods.He lauded government agencies for rescuing people from flood-affected areas.